For every vendor, this report shows the number of items sold, as well as aggregate list price, discount, net price, net cost, margin and average percentage margin during a period of time defined by the user. This report provides a quick way to see which vendors are generating the most revenue, which vendors provide items that require the most discounts, and which vendors offer the highest-margin products. This kind of report can be very useful when negotiating with vendors as it allows you to point out to a given vendor that the margins on his merchandise are lower than on those from other vendors, or that you are having to sell a lot of his items at a discount. For each of these summary reports (sales by vendor, brand or color, for example) there are a couple of backup reports that show the detail behind the total figures. These reports are the "proof" behind the numbers. The first of these backup reports breaks the total down by style. 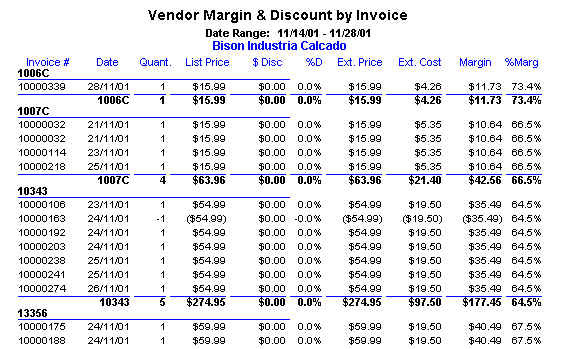 In the example above, 47 items from the vendor Bison Industria Calcado were sold during the period. In this next report, we can see how many items were sold for each of the styles of that vendor. For each style we see the total number sold, the total list price, total discount, total net price, total net docst, total margin and average margin as a percentage. The second layer of detail is at the invoice level. Once again, for each vendor we see the corresponding styles. 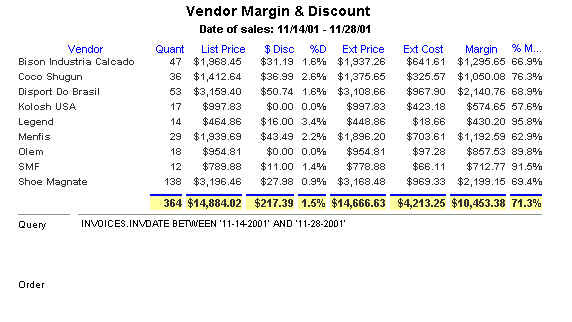 This report shows the invoice(s) behind every style, detailing list price, discount, net price, cost and margin. The first report tells us that there 47 items belonging to the Bison Industria Calcado were sold during the period; the second report tells us that of these, 4 of the items sold belong to the 1007C style; and, this third report tells us that the first of these four was sold on November 21, 2001 and so on. The final level of detail (not shown here) would give us greater detail for each invoice, showing, for example, the size and color for each style sold.